AshleyNewell.me: Unity Plus Limelight Equals Happy! Unity Plus Limelight Equals Happy! Super quick post since I'm going to be making lunch for 12 people in a couple minutes here. I feel like I've lost my mind! But my friends are having a hard time, so I do what I can. I combined the Limelight sketch and product challenge (SPARKLES!! Hello, I love it!) 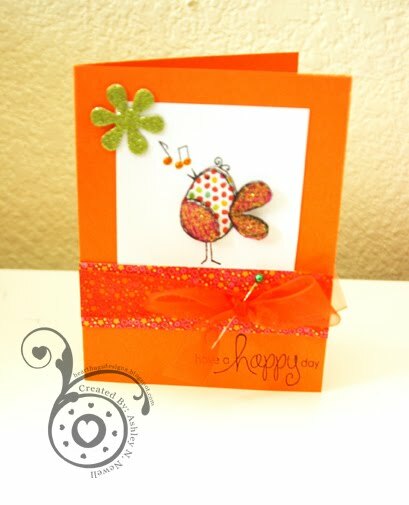 with a Unity challenge to use birds or trees on your card to create this. This set is Could I Be Any Cuter which is only sold at Unity retailers, like Limelight. The paper is K&Company. This cute card makes me happy. First off, are you crazy?! :-) I hope you are making PBJs or something. You are very sweet for doing that for your friends tho! And super cute card! Love the colors and SPARKLE! This is so cheery and fun! I love it! Love the colors on this card, makes me think of spring! !